Steve and Sandy Aholt, missionaries to Goroka, Papau New Guinea were back for a short furlough from June 21 to July 03 of 2008. 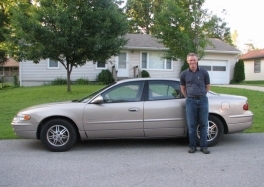 The Aholt's were able to use the 2001 Buick Regal traveling 540 miles. The Aholts are supported throught ABWE out of Harrisburg, PA.
Matt Stensaas on the left, is a Missionary to Uganda, Africa. Stensaas is supported through BIMI out of Chattanooga, TN. His home church is Calvary Baptist in Marshall, MO under Pastor Steve Raglin. The Stensaas Family was using this 1994 Ford E-150 Conversion van while on furlough from August 21, 2007 to July 21, 2008. They traveled a total of 29,947 miles, through 38 states and visiting 72 churches. 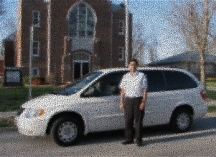 Daniel & Abigail Jacobo used the 2003 Dodge Caravan from March 25th, 2008 to July 22, 2008 traveling 9,064 miles while on furlough. The Jacobo Family are missionaries to Honduras, supported through BIMI ( Baptist International Missions, Inc.) out of Chattanooga, TN. Their home church is Coast Hills Baptist Church in Santa Maria, CA under Pastor Bud Silva. Steven Huestis Family, missionary to Brazil, used this 2001 Chrysler Town & Country from Feb. 21, 2008 to July 30, 2008 traveling 21,269 miles. Huestis is sent out of Northeast Baptist Church in Independence, MO under Pastor John Tucker. The Huestis Family is supported through Baptist International Missions, Inc (BIMI) out of Harrison, TN. 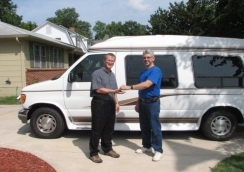 Missionaries to ********, used BMTM's 2003 Dodge Caravan from August 16th to September 12th of 2008 traveling 4,540 miles. This family is sent out of their home church Northwest Bible Baptist Church in Elgin, Illinois under Dr. Keith Gomez. Name & Field withheld for Missionaries protection. On occasion our Pastor, Charles Kaighen of Grace Baptist Church, uses a BMTM vehicle for trips to Conferences and meetings that are several hours away. His most recent trip of 632 miles, was a Preaching Jubilee at Marion Avenue Baptist Church in Washington, IA under Dr. Larry Brown. 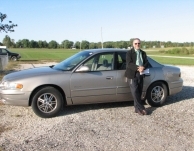 Evangelist Fred Reed was able to use a BMTM vehicle while in the Midwest from September 29, 2008 to October 31, 2008. While in town for revival meetings, Reed needed a vehicle for future meetings in surrounding areas in Missouri and Kansas. Reed is sent out of Gospel Light Baptist Church in Hot Springs, AR under Dr. Eric Capaci. 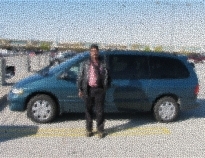 Sam Dayanand had the 2003 Chrysler Town & Country LS on furlough from April 15, 2008 to September 30, 2008 traveling 21,801 miles. Dayanand, a missionary to India, is supported through BIMI (Baptist International Missions, Inc) out of Chattanooga, TN. Their home church is Grace Baptist Church in Chattanooga, TN under Pastor Steve Euler. Missionary to Romania, Tim Tyler, had this 2005 Dodge Grand Caravan from May 15th,2008 to October 23rd, 2008 while traveling 31,931 miles on furlough. The Tyler's are supported through BIMI in Chattanooga, TN. Their home church is Lancaster Baptist Church in Lancaster, CA under Dr. Paul Chappell. 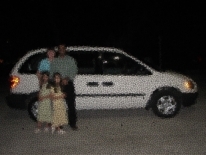 The Dave Ferris family, missionary to the Philippines was home on furlough from April 17th, 2008 to November 6th, 2008 using this 2006 Dodge Grand Caravan. They traveled a total of 26,798 miles. Ferris is supported through Chinook Baptist Church out of Eltopia, WA. Their home church is in Pasco, WA. 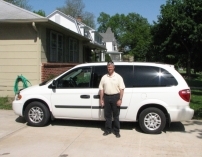 Uri Marcus, with the Nehemiah Restoration Fund was in a BMTM vehicle from October 5, 2008 to November 11, 2008. He traveled 1,759 miles. Marcus is serving the Lord in Israel with his home church being in Eastbend, NC. **** had the 1999 Dodge Grand Caravan from October 25th, 2008 to November 25th, 2008 traveling 4.075 miles. **** is a missionary to *****, sent out of Emmanuel Baptist Bible Church of Martville, NY under Pastor Bryant Lagoe. Picture distorted and name withheld for Missionary's protection.